The bone marrow—the sponge-like tissue found in the center of certain bones—contains stem cells that are the precursors of white blood cells, red blood cells, and platelets. These blood cells are vital for normal body functions, such as oxygen transport, defense against infection and disease, and clotting. Blood cells have a limited lifespan and are constantly being replaced; therefore, healthy stem cells are vital. In association with certain diseases, stem cells may produce too many, too few, or otherwise abnormal blood cells. Also, medical treatments may destroy stem cells or alter blood cell production. The resultant blood cell abnormalities can be life threatening. Bone marrow transplantation involves extracting bone marrow containing normal stem cells from a healthy donor, and transferring it to a recipient whose body cannot manufacture proper quantities of normal blood cells. The goal of the transplant is to rebuild the recipient's blood cells and immune system and hopefully cure the underlying ailment. In autologous bone marrow transplantation, stem cells are collected from the patient. Once the patient has undergone chemotherapy, the cells are replaced in the blood via an intravenous catheter. The cells return to the bone marrow and begin producing healthy new cells. A person's red blood cells, white blood cells, and platelets may be destroyed or may be abnormal due to disease. Also, certain medical therapies, particularly chemotherapy or radiation treatment, may destroy a person's stem cells. The consequence to a person's health is severe. Under normal circumstances, red blood cells carry oxygen throughout the body and remove carbon dioxide from the body's tissues. White blood cells form the cornerstone of the body's immune system and defend it against infection. Platelets limit bleeding by enabling the blood to clot if a blood vessel is damaged. A bone marrow transplant is used to rebuild the body's capacity to produce these blood cells and bring their numbers to normal levels. Illnesses that may be treated with a bone marrow transplant include both cancerous and noncancerous diseases. ABO antigen — Protein molecules located on the surfaces of red blood cells that determine a person's blood type: A, B, or O.
Allogeneic — Referring to bone marrow transplants between two different, genetically dissimilar people. AML — Acute myelogenous leukemia, also called acute myelocytic leukemia. Malignant disorder where myeloid blast cells accumulate in the marrow and bloodstream. Anemia — Decreased red cell production which results in deficiency in oxygen-carrying capacity of the blood. Antigen — A molecule that is capable of provoking an immune response. Aplastic anemia — A disorder in which the body produces inadequate amounts of red blood cells and hemoglobin due to underdeveloped or missing bone marrow. Autologous — Referring to bone marrow transplants in which recipients serve as their own donors. Blank — If an individual has inherited same HLA antigen from both parents, the HLA typing is designated by the shared HLA antigen followed by a "blank"(—). Blast cells — Blood cells in early stage of cellular development. Blast crisis — Stage of chronic myelogenous leukemia where large quantities of immature cells are produced by the marrow and is not responsive to treatment. Bone marrow — A spongy tissue located within flat bones, including the hip and breast bones and the skull. This tissue contains stem cells, the precursors of platelets, red blood cells, and white blood cells. Bone marrow transplant — Healthy marrow is infused into people who have had high-dose chemotherapy for one of the many forms of leukemias, immunodeficiencies, lymphomas, anemias, metabolic disorders, and sometimes solid tumors. Chemotherapy — Medical treatment of a disease, particularly cancer, with drugs or other chemicals. Chronic myelogenous leukemia (CML) — Also called chronic myelocytic leukemia, malignant disorder that involves abnormal accumulation of white cells in the marrow and bloodstream. Conditioning — Process of preparing patient to receive marrow donation, often through the use of chemotherapy and radiation therapy. Confirmatory typing — Repeat tissue typing to confirm the compatibility of the donor and patient before transplant. Cytomegalovirus (CMV) — Virus that can cause pneumonia in post bone marrow transplant patients. Donor — A healthy person who contributes bone marrow for transplantation. Graft versus host disease — A life-threatening complication of bone marrow transplants in which the donated marrow causes an immune reaction against the recipient's body. Histocompatibility — The major histocompatibility determinants are the human leukocyte antigens (HLA) and characterize how well the patient and donor are matched. HLA (human leuckocyte antigen) — A group of protein molecules located on bone marrow cells that can provoke an immune response. A donor's and a recipient's HLA types should match as closely as possible to prevent the recipient's immune system from attacking the donor's marrow as a foreign material that does not belong in the body. Hodgkin's disease — A type of cancer involving the lymph nodes and potentially affecting nonlymphatic organs in the later stage. Immunodeficiency — A disorder in which the immune system is ineffective or disabled either due to acquired or inherited disease. Leukemia — A type of cancer that affects leukocytes, a particular type of white blood cell. A characteristic symptom is excessive production of immature or otherwise abnormal leukocytes. Lymphoma — A type of cancer that affects lymph cells and tissues, including certain white blood cells (T cells and B cells), lymph nodes, bone marrow, and the spleen. Abnormal cells (lymphocyte/leukocyte) multiply uncontrollably. Match — How similar the HLA typing, out of a possible six antigens, is between the donor and the recipient. Mixed lymphocyte culture (MLC) — Test that measures level of reactivity between donor and recipient lymphocytes. Neuroblastoma — Solid tumor in children, may be treated by BMT. Platelets — Fragments of a large precursor cell, a megakaryocyte found in the bone marrow. These fragments adhere to areas of blood vessel damage and release chemical signals that direct the formation of a blood clot. Recipient — The person who receives the donated blood marrow. Red blood cells — Cells that carry hemoglobin (the molecule that transports oxygen) and help remove wastes from tissues throughout the body. Sickle cell anemia — An inherited disorder characterized by a genetic flaw in hemoglobin production. (Hemoglobin is the substance within red blood cells that enables them to transport oxygen.) The hemoglobin that is produced has a kink in its structure that forces the red blood cells to take on a sickle shape, inhibiting their circulation and causing pain. This disorder primarily affects people of African descent. Syngeneic — Referring to a bone marrow transplant from one identical twin to the other. Thalassemia — A group of inherited disorders that affects hemoglobin production. (Hemoglobin is the substance within red blood cells that enables them to transport oxygen.) Because hemoglobin production is impaired, a person with this disorder may suffer mild to severe anemia. Certain types of thalassemia can be fatal. White blood cells — A group of several cell types that occur in the bloodstream and are essential for a properly functioning immune system. various types of leukemia, Hodgkin's disease, lymphoma, breast and ovarian cancer, and other cancers. Noncancerous diseases for which bone marrow transplantation can be a treatment option include aplastic anemia, sickle cell anemia, thalassemia, and severe immunodeficiency. Bone marrow transplants are not for everyone. Transplants are accompanied by a risk of infection, transplant rejection by the recipient's immune system, and other complications. The procedure has a lower success rate the greater the recipient's age. Complications are exacerbated for people whose health is already seriously impaired as in late-stage cancers. Therefore, a person's age or state of health may prohibit use of a bone marrow transplant. The typical cut-off age for a transplant ranges from 40 to 55 years; however, a person's general health is usually the more important factor. Even in the absence of complications, the transplant and associated treatments are hard on the recipient. Bone marrow transplants are debilitating. A person's ability to withstand the rigors of the transplant is a key consideration in deciding to use this treatment. Two important requirements for a bone marrow transplant are the donor and the recipient. Sometimes, the donor and the recipient may be the same person. This type of transplant is called an autologous transplant. It is typically used in cases in which a person's bone marrow is generally healthy but will be destroyed due to medical treatment for diseases such as breast cancer and Hodgkin's disease. Most bone marrow transplants are autologous. If a person's bone marrow is unsuitable for an autologous transplant, the bone marrow must be derived from another person in an allogeneic transplant. Allogeneic transplants are more complicated because of proteins called human lymphocyte antigens (HLA) that are on the surface of bone marrow cells. If the donor and the recipient have very dissimilar antigens, the recipient's immune system regards the donor's bone marrow cells as invaders and launches a destructive attack against them. Such an attack negates any benefits offered by the transplant. There are only five major HLA classes or types—designated HLA-A,-B,-C,-D, and class III—but much variation within the groupings. For example, HLA-A from one individual may be similar to, but not the same as, HLA-A in another individual; such a situation can render a transplant from one to the other impossible. HLA matching is more likely if the donor and recipient are related, particularly if they are siblings; however, an unrelated donor may be a potential match. Only in rare cases is matching HLA types between two people not an issue: if the recipient has an identical twin. Identical twins carry the same genes; therefore, the same antigens. A bone marrow transplant between identical twins is called a syngeneic transplant. A relatively recent development in stem cell transplantation is the use of peripheral blood cells instead of stem cells from bone marrow. Peripheral blood stem cells (PBSCs) are obtained from circulating blood rather than from bone marrow, but the amount of stem cells found in the peripheral blood is much smaller than the amount of stem cells found in the bone marrow. Peripheral blood stem cells can be used in either autologous or allogeneic transplants. The majority of PBSC transplants are autologous. However, recent clinical studies indicate that PBSCs are being used more frequently than bone marrow for allogeneic bone marrow transplantation. The advantages of PBSC transplants when compared to bone marrow transplants are: in allogeneic transplantation, haematopoietic and immune recovery are faster with PBSCs which reduces the potential for disease recurrence, primarily graft-versus-host-disease. In autologous transplantation, the use of PBSCs can result in faster blood count recoveries. Also, some medical conditions exist in which the recipient cannot accept bone marrow stem cell transplants, but can accept PBSC transplants. Some possible disadvantages to PBSC transplant versus bone marrow transplantation are: so much more fluid volume is necessary to collect enough PBSCs that, at the time of infusing the new stem cells into the recipient, the fluid can collect in the lungs or cause temporary kidney problems. Also, the time commitment for the donor for a PBSC transplant is considerable. When the PBSCs are being collected, several outpatient sessions are needed and each session lasts approximately two-four hours. BONE MARROW TRANSPLANTATION. The bone marrow extraction, or harvest, is the same whether for an autologous or allogeneic transplant. Harvesting is done under general anesthesia (i.e., the donor sleeps through the procedure), and discomfort is usually minimal afterwards. Bone marrow is drawn from the iliac crest (the part of the hip bone to either side of the lower back) with a special needle and a syringe. Several punctures are usually necessary to collect the needed amount of bone marrow, approximately 1-2 quarts (0.9-1.91). (This amount is only a small percentage of the total bone marrow and is typically replaced within four weeks.) The donor remains at the hospital for 24-48 hours and can resume normal activities within a few days. If the bone marrow is meant for an autologous transplant, it is stored at −112 to −320°F (−80 to −196°C) until it is needed. Bone marrow for an allogeneic transplant is sometimes treated to remove the donor's T cells (a type of white blood cell) or to remove ABO (blood type) antigens; otherwise, it is transplanted without modification. The bone marrow is administered to the recipient via a catheter (a narrow, flexible tube) inserted into a large vein in the chest. From the bloodstream, it migrates to the cavities within the bones where bone marrow is normally stored. If the transplant is successful, the bone marrow begins to produce normal blood cells once it is in place, or engrafted. PERIPHERAL BLOOD STEM CELL TRANSPLANTATION. Before collection for a PBSC transplant, donors receive daily four injections of the drug G-CSF, or filgrastim. (Patients can give it to themselves at home if need be.) These pretreatments stimulate the body to release stem cells into the blood. After these pretreatments, the donors' experience is similar to that of a whole blood donor's experience—PBSC donors' blood is collected at a clinic or hospital as an outpatient procedure. The differences are that several sessions will be needed over days or weeks and the blood is collected in a process called apheresis. The blood travels from one arm into a blood cell separator that removes only the stem cells, and the rest of the blood is returned back to the donor, in the other arm. The cells are then frozen for later use. The PBSCs are administered to the recipient using the same methods as those used in bone marrow transplantation. As stated, the amount of fluid with PBSCs infused into the recipient's body can be an issue. Bone marrow transplantation is an expensive procedure. (Bone marrow donors are volunteers and do not pay for any part of the procedure.) Insurance companies and health maintenance organizations (HMOs) may not cover the costs. A bone marrow transplant recipient can expect to spend four to eight weeks in the hospital. In preparation for receiving the transplant, the recipient undergoes "conditioning"—a preparative regimen in which the bone marrow and abnormal cells are destroyed. Conditioning rids the body of diseased cells and makes room for the marrow to be transplanted. It typically involves chemotherapy and/or radiation treatment, depending on the disease being treated. Unfortunately, this treatment also destroys healthy cells and has many side effects such as extreme weakness, nausea, vomiting, and diarrhea. These side effects may continue for several weeks. A two- to four-week waiting period follows the marrow transplant before its success can begin to be judged. The marrow recipient is kept in isolation during this time to minimize potential infections. The recipient also receives antibiotic medications and blood and platelet transfusions to help fight off infection and prevent excessive bleeding. Further side effects, such as nausea and vomiting, can be treated with other medications. Once blood counts are normal and the side effects of the transplant abate, the recipient is taken off antibiotics and usually no longer needs blood and platelet transfusions. Following discharge from the hospital, the recipient is monitored through home visits by nurses or outpatient visits for up to a year. For the first several months out of the hospital, the recipient needs to be careful in avoiding potential infections. For example, contact with other people who may be ill should be avoided or kept to a minimum. Further blood transfusions and medications may be necessary, but barring complications, the recipient can return to normal activities about 6-8 months after the transplant. Bone marrow transplants are accompanied by serious and life-threatening risks. Furthermore, they are not always an absolute assurance of a cure for the underlying ailment; a disease may recur in the future. Approximately 30% of people receiving allogeneic transplants do not survive. Autologous transplants have a much better survival rate—nearly 90%—but are not appropriate for all types of ailments requiring a bone marrow transplant. Furthermore, they have a higher failure rate with certain diseases, specifically leukemia. In the short term, there is the danger of pneumonia or other infectious disease, excessive bleeding, or liver disorder caused by blocked blood vessels. The transplant may be rejected by the recipient's immune system, or the donor bone marrow may launch an immune-mediated attack against the recipient's tissues. This complication is called acute graft versus host disease, and it can be a life-threatening condition. Characteristic signs of the disease include fever, rash, diarrhea, liver problems, and a compromised immune system. Approximately 25-50% of bone marrow transplant recipients develop long-term complications. Chronic graft versus host disease symptoms include skin changes such as dryness, altered pigmentation, and thickening; abnormal liver function tests; dry mouth and eyes; infections; and weight loss. Other long-term complications include cataracts (due to radiation treatment), abnormal lung function, hormonal abnormalities resulting in reduced growth or hypothyroidism, secondary cancers, and infertility. In a successful bone marrow transplant, the donor's marrow migrates to the cavities in the recipient's bones and produces normal numbers of healthy blood cells. Bone marrow transplants can extend a person's life, improve quality of life, and may aid in curing the underlying ailment. Dreger, P., and N. Schmitz. "Allogeneic transplantation of blood stem cells: coming of age?" Annals of Hematology 80, no. 3 (March, 2001): 127-36. Nuzhat, Iqbal, Donna Salzman, Audrey J. Lazenby, et al. "Diagnosis of Gastrointestinal Graft-Versus-Host Disease." The American Journal of Gastroenterology 95 (November, 2000): 3034- 3038. American Society for Blood and Marrow Transplantation (ASBMT). 85 W. Algonquin Road, Suite 550 Arlington Heights, IL 60005. (847) 427-0224. mail@asbmt.org. Founded in 1990, a national professional association that promotes advancement of the field of blood and bone marrow transplantation in clinical practice and research. Blood & Marrow Transplant Newsletter (Formerly BMT Newsletter). 2900 Skokie Valley Road, Suite B, Highland Park, IL 60035 (847) 433-3313. 1-888-597-7674. help@bmtinfonet.org. 〈http://www2.bmtnews.org〉. Blood & Marrow Transplant Newsletter is a not-for-profit organization that provides publications and support services to bone marrow, peripheral blood stem cell, and cord blood transplant patients and survivors. BMT Information http://www.bmtinfo.org/. Web site, sponsored by a variety of other bone marrow transplant organizations, lists basic information and resources about bone marrow transplants. Health Resources and Services Administration. 5600 Fishers Lane, Rm. 14-45, Rockville, MD 20857, 301-443-3376, comments@hrsa.gov. http://www.hrsa.gov. HRSA manages contracts for the Organ Procurement and Transplantation Network, Scientific Registry of Transplant Recipients and National Marrow Donor Program and provides public education and technical assistance to increase donation. HRSA also monitors the performance of the nation's transplant centers and provides potential transplant recipients with survival rates and other vital information. International Bone Marrow Transplant Registry/Autologous Blood and Marrow Transplant Registry N. America. Health Policy Institute, Medical College of Wisconsin. 8701 Watertown Plank Road, P.O. Box 26509, Milwaukee, WI 53226 USA. (414) 456-8325. ibmtr@mcw.edu. Voluntary organizations of more than 400 institutions in 47 countries that submit data on their allogeneic and autologous blood and marrow transplant recipients to the IBMTR/ABMTR Statistical Center at the Medical College of Wisconsin in Milwaukee. Leukemia & Lymphoma Society, Inc. 1311 Mamaroneck Avenue White Plains, NY 10605. (914) 949-5213. http://www.leukemia-lymphoma.org/. National voluntary health agency dedicated to curing leukemia, lymphoma, Hodgkin's disease and myeloma, and to improving the quality of life of patients and their families. National Marrow Donor Program. Suite 500, 3001 Broadway Street Northeast, Minneapolis, MN 55413-1753. (800) MARROW-2. http://www.marrow.org. Founded in 1986, The National Marrow Donor Program (NMDP) is a non-profit international leader in the facilitation of unrelated marrow and blood stem cell transplantation. National Organ and Tissue Donation Initiative. http://www.organdonor.gov/. Created by Health Resources and Services Administration (HRSA) Department of Health and Human Services (DHHS) http://www.os.dhhs.gov/. Provides information and resources on organ donation and transplantation issues. grafting of bone marrow tissue; used in aplastic anemia, primary immunodeficiency, acute leukemia (following total body irradiation), and in patients with cancer (for example, breast) who undergo extensive chemotherapy such that their bone marrow is destroyed. the transplantation of bone marrow from a healthy donor to stimulate production of normal blood cells. The marrow may be autologous (from a previously harvested and stored self-donation) or allogeneic (from a living related donor or a living unrelated donor). The bone marrow is removed from the donor by aspiration and infused intravenously into the recipient. Used to treat malignancies, such as leukemia, lymphoma, myeloma, and selected solid tumors; and nonmalignant conditions, such as aplastic anemia, immunological deficiencies, and inborn errors of metabolism. Transplantation is usually preceded by chemotherapy and total body radiation of the recipient. The infusion of haematopoietic precursors or stem cells to re-establish BM function after chemotherapy or RT damage, or defective BM. GVHD with skin rash, hepatic defects, diarrhoea, infections, autoimmune reactions. GVHD (35–60%); interstitial pneumonia, idiopathic or viral (CMV); HSV; varicella-zoster; post-BMT leukemic relapse or AML from donor into an HLA-identical sibling for CML. Opportunistic infections (e.g., CMV pneumonia)—85% mortality; prophylactic gancyclovir decreased this complication; other causes of interstitial pneumonia include Pneumocystis carinii or RT. Autologous (from patient’s own BM); allogeneic (BM from someone else); syngeneic (BM from identical twin). Aplastic anaemia—5-year survival, 80%; ANLL, 50%; ALL, 25%; BMT survival in leukaemia depends on chronicity and cell type; BMT survival in non-neoplastic conditions 63–75+%; minor HLA mismatching is acceptable. • Proven effective—Leukaemia, aplastic anaemia, inborn errors of metabolism (e.g., adrenoleukodystrophy, Hurler syndrome, osteopetrosis, metachromatic leukodystrophy). • Somewhat effective—Lymphoma, thalassemia major, osteopetrosis, icongenital immune deficiencies (e.g., Wiscott-Aldrich disease, SCID). Hematology The infusion of hematopoietic precursors or stem cells to re-establish BM function after chemotherapy or RT damage, or defective BM Complications GVHD–35-60%, interstitial pneumonia, idiopathic, or viral–CMV, HSV, varicella-zoster; post-BMT leukemic relapse or AML from donor into an HLA-identical sibling for CML Cause of death Opportunistic infections–eg, CMV pneumonia–85% mortality; prophylactic gancyclovir ↓ this complication; other causes of interstitial pneumonia include Pneumocystis carinii or RT Clinical GVHD with skin rash, hepatic defects, diarrhea, infections, autoimmunity Types Allogeneic, autologous Indications BMT is appropriate and often successful in leukemia and aplastic anemia, but less so in treating lymphoma, thalassemia major, osteopetrosis, inborn errors of metabolism–adrenoleukodystrophy, Hurler syndrome, osteopetrosis, metachromatic leukodystrophy, congenital immune deficiencies–eg, Wiscott-Aldrich disease, SCID Types Autologous-Pt's own BM; allogeneic-BM from someone else; syngeneic–BM from identical twin Prognosis Aplastic anemia–5-yr survival-80%; ANLL-50%; ALL-25%; BMT survival in leukemia depends on chronicity and cell type; BMT survival in non-neoplastic conditions 63-75+%; minor HLA mismatching is OK. See Autologous BMT, Chemotherapy, Relapse, Remission. the transfer of living organs and tissue from one part of the body to another or from one individual to another. Transplantation and grafting mean the same thing, though the term grafting is more commonly used to refer to the transfer of skin. See grafting (1). 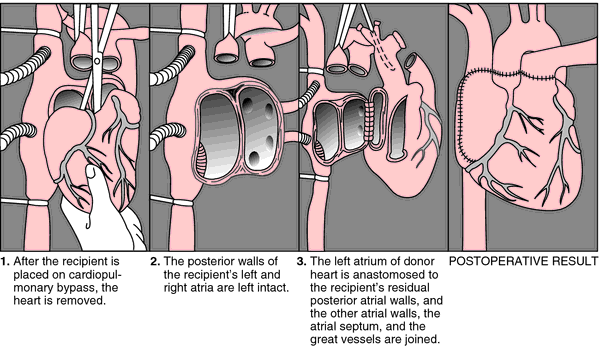 Occasionally an organ is transplanted from one place to another within the body (autotransplants). Kidneys, for example, have been relocated to enable them to continue functioning after the ureters have been damaged. See also graft rejection. has been used in the treatment of a variety of hematopoietic and immunological disorders, e.g. in dogs with aplastic anemia. full-depth and part-depth (lamellar) transplants are performed in animals when there is scarring of the cornea in the visual axis but the operation is difficult, the aftercare intensive and the failure rate high. the study of immune responses that distinguish between self and nonself and the rejection of transplanted tissue or organs. the procedure is not favored in horses where it was at one time used as a treatment for tendonitis. The success rate for return to racing performance is poor. Devise corrective measures for pipeline projects by understanding Bone Marrow Transplantation pipeline depth and focus of Indication therapeutics. Bone marrow transplantation is currently considered the treatment of choice for severe aplastic anemia, specific immune deficiency states (e.
PLX-I, its first adult stem cell product, is intended to target a critical global shortfall of matched tissue for bone marrow transplantation since bone marrow transplantation is often the only cure for patients suffering from leukemia, lymphoma, myeloma and many other hematological diseases. The contract is for: supply and installation at the site of use: hospital beds with equipment, chairs and trolleys, to the Department of Bone Marrow Transplantation, Oncology and Hematology Clinic at the Clinical Center of the Medical University in Wroclaw, ul. A total of 113 patients had suitable donors for allogeneic bone marrow transplantation; the others were randomly assigned to either autologous bone marrow transplantation or to a single course of high-dose cytarabine. PLX-I cells are Pluristem's first potential product dedicated to resolving the global shortfall of matched tissue for bone marrow transplantation by improving the engraftment of umbilical cord blood. Contract notice: Supply, installation and connection to the existing installation of laboratory furniture in the indicated spaces clinic of bone marrow transplantation, oncology and hematology clinic in the clinical center of the medical university in wroclaw, ul. the use of thalidomide "may well be one of the most important advances in bone marrow transplantation. Thalidomide: is there a silver lining? Prather will develop strategies for enhancing our North American activities; that PLX technology is immunologically privileged and offers a significant advantage to patients facing immune reactions to cell therapy such as autoimmune disorders, that our company have developed a solution that could be used to replace the traditional bone marrow transplant search and match process; that we expect our first products to be cell grafts that will provide an efficient and superior alternative to the standard procedure of bone marrow transplantation; and our first adult stem cell product targets a critical global shortfall of matched tissue for bone marrow transplantation. But neither iodide nor bone marrow transplantation is a panacea.